Reader: When should I wear different types of coats? (bar, wedding, work, street style, super casual etc). Great question! The fact that you know that there should be a differentiation between the coats you wear for each occasion means you are off to a good start. Having one coat for the winter and another one for the spring used to be okay, but outerwear has become just as important as the clothes you are wearing these days. If you live in the Northeast, it is cold a solid six months out of the year (maybe more if we have a cold spring and/or summer). Shouldn’t we take pride in the coats we are wearing if that is the case? I’d say so! Invest in quality. I bought a down jacket freshman year of college (eight years ago). I still pull that puffy piece out every winter and will certainly be doing the same this year. A good coat can last for years. Note that quality does not need to be expensive. My best tip when it comes to heavier winter coats is to go when stores are having a sale. You will be surprised how quickly outerwear goes on sale. The reality is that most stores want most of their cold weather items out by end of year so they can start showing spring. Kind of crazy, but that is just how they roll. Use this to your advantage. A great time (that is coming up soon) to buy a coat is Cyber Monday and/or Black Friday. Space out purchases. I do not mean space it out in months, I mean space it out in years. Coats last so really you should only be buying a maximum of two coats per year, but honestly depending on your collection two may even be too much. I personally had an over-the-door coat rack break recently, so that probably means I should hold off on any new purchases this season. Make unique purchases. This one is simple. You do not need 3 black pea coats or 2 down jackets. Every time you decide to buy a new coat make sure you either have nothing like it or you using it as a replacement for something similar you already own. It seems obvious, but still needs to be said. If you like to shop there is a good chance you have redundancies in your wardrobe in general. This can get tricky when it gets cold— especially if you live somewhere like New York City and you are not driving everywhere. My strong suggestion for bar nights is a leather jacket for as long as you can handle it. Most bars do not have a coat check, which means you will either have to hold you coat or keep it on. A leather jacket compliments your outfit and if you really want to take it off it is pretty light to hold. If you are going somewhere you know has a place for coats, by all means wear a heavier jacket when the weather cools down. In all other cases, bring out the leather. Never wear a long puffy down jacket. It may be warm, but it looks terrible. That’s my first rule. My second is to think of proportions. If the wedding is formal and requires that you wear a gown wear a coat that is cropped. My suggestion is a shaggy faux fur for a glam look. If your dress is semi-formal and short, wear a long coat. 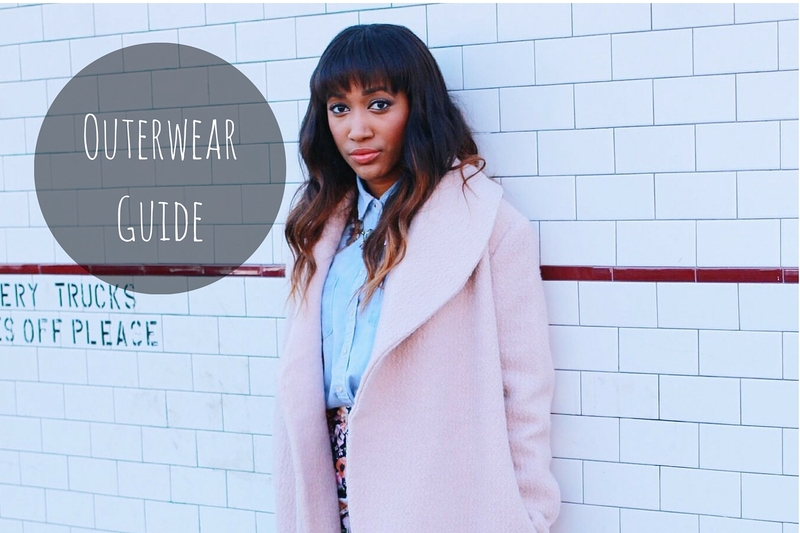 If you wear a coat that is the exact same length as your dress there is a good chance it will look like you are wearing nothing underneath. We know you have something on, but perception is reality fashionistas. Try a coat that hits below the knee. It makes a world of difference. My third and final rule for wedding outerwear is to keep it glam. Whichever coat you choose to wear, make sure that is it just as fabulous as the dress you have on. It should compliment the dress you have on and not take way from its beauty. Refer back to my first rule. Just don’t do it. When it comes to work I say keep it classic. Choose structured coats that are timeless. It compliments your office look so much when you do it this way. Try a light trench when the weather is moderate and transition to a pea coat when the weather cools down. Invest in a pea coat that is mostly wool. It will keep you so much warmer! When it comes to super casual I say choose comfort and warmth. Go for a parka. It is not quite as overwhelming as a down jacket, but does the job in the warmth department. It will look super cute with any casual outfit. From jeans and sweater to sneakers and leggings a parka is the perfect casual coat! I lumped weekend style in with street style because they sort of fall into the same category. Saturday lunch with your friends, Sunday brunch with your family, or any weekend activity that requires us not to wear yoga pants and Uggs. This could be applied to during the week as well, but most of us have 9-5 jobs. So, the only time we do dressy casual is on the weekends. The options are really endless in this category. I say that because it really depends on you and your style. Maybe you like a more grunge look, pull on that leather jacket. You could be a girl who likes a more glam look, fur coats look awesome with jeans and do not let anyone tell you anything different. A boyfriend coat (coat #1) is super comfy, but chic at the same time. A bomber jacket (coat #2) is great for the girls who have a little bit of a tomboy side. The moral of the story is that the street style is about you, wear whatever coat expresses your style. Do not subscribe to any rules and be you.